The Association of Illustrators publishes a detailed update on the campaign on their website – Read the full interview here. I’ve listen to countless illustrators mourn how their names didn’t appear on the covers of book they’ve illustrated. I’ve heard them seethe with anger as their cover artwork was shared on Twitter, attributed only to a writer’s name. I’ve seen display boards in classrooms themed on favourite picture books with the writer’s name in huge letters and no mention of the book’s illustrator. The list goes on. I’ve seen how when illustrators complained they were being cut out, they’d get a few replies of sympathy, but nothing seemed to change. Elderly illustrators told me they’d been trying to change things for decades and failed. Asking for respect wasn’t working. Morosely plucking people’s heartstrings wasn’t working. 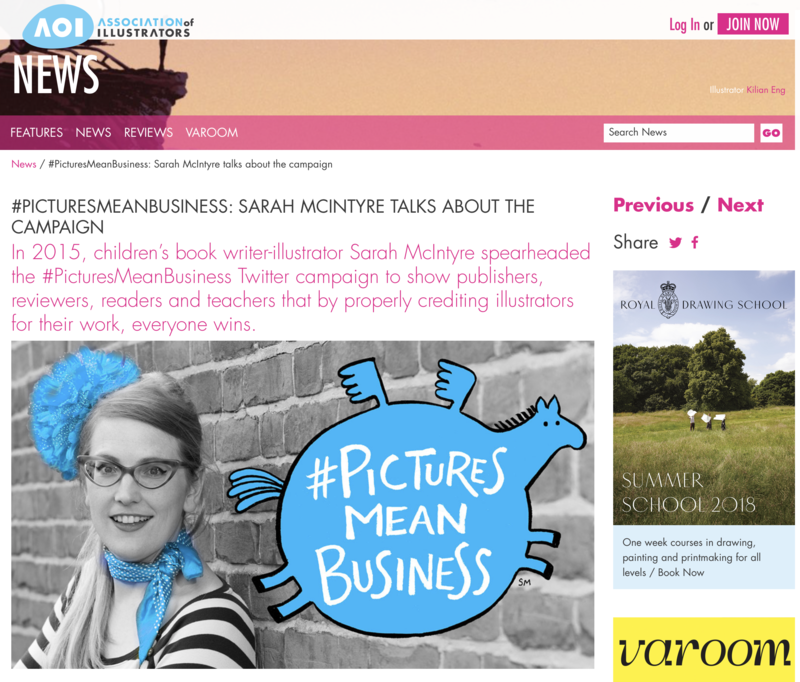 That’s why I decided we illustrators needed to rethink our strategy and #PicturesMeanBusiness campaign seems to be making some progress. We can make a legitimate case to publishers, reviewers, readers, parents, teachers that they themselves actually WIN when illustrators are credited. It costs very little to credit us, and it costs a lot if they don’t. Many of them believe they care about illustrators but they need a business angle to spur them to action. It’s a positive campaign.